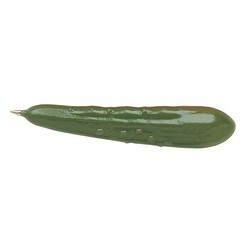 Your marketing strategy is going to grow with this ballpoint pickle shaped veggie pen customized with your logo or slogan. An ideal promotional giveaway at supermarket openings, restaurants, the agricultural industry or any other food based company. Products are not intended for use by children or pets. They may present a choking hazard to children under 3 years of age.